If you’ve been following the job numbers closely, you’ll know that this recession we’ve seen a particularly sharp drop in labor force participation. Labor force participation measures how many people either have a job or are looking for a job as a percentage of the population. As of March 2012 labor force participation has dropped to 63.6%, the lowest point since December 1981. Because the unemployment rate doesn’t measure people who aren’t in the Labor Force, many (especially conservatives) have noted that the unemployment rate is “artificially” low and that many have left the labor force, basically giving up even looking for a job. One Twitter friend, @rizzuhjj, pointed out that the Chicago Fed has a paper that claims that half of the post-1999 decline in the labor force is due to long-term demographic trends, specifically, Baby Boomers aging. Here is a chart of the labor force participation rate since it the last time it was this low. 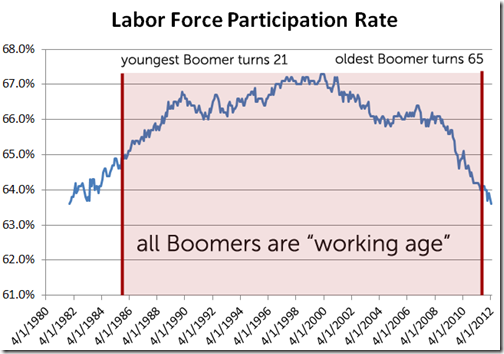 You can see that we’re at the point where Boomers are starting to retire, so surely that would be driving the massive drop in labor force participation and not due to the recession, right? To test this, I decided to sift through the employment data by age, as provided by the BLS. In January 2008, the participation rate by age looked like this (click to enlarge). 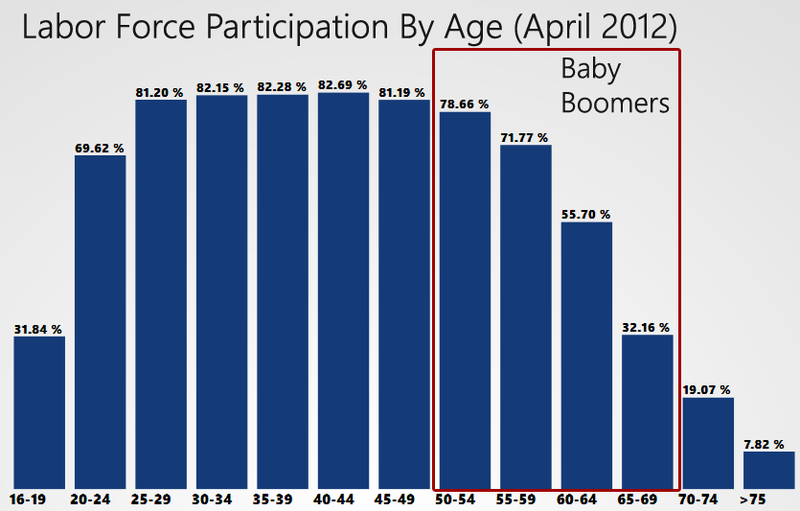 You can see that the boomers are largely entering the age ranges where participation in the labor force drops off significantly. So, on the surface, this explanation makes sense. This was my test: Take the participation rates for post-Baby Boomers (16-49 year old) and multiply them for the corresponding populations for those ages. That way we’ve isolated just the post-Baby Boomer labor force and can see if it is smaller now than it was 3 years ago. This is what I found. 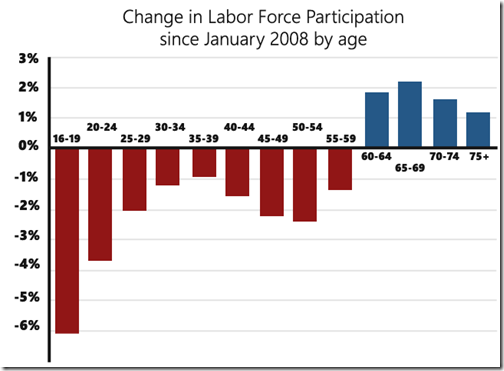 Or, to make it a little clearer, this is the change in labor force participation by age since January 2008. Apply the January 2008 participation rates to current population and this means we are missing 3.4 million post-Baby Boom workers from the labor force. These post-Boomers account for 68% of the “missing” work force. 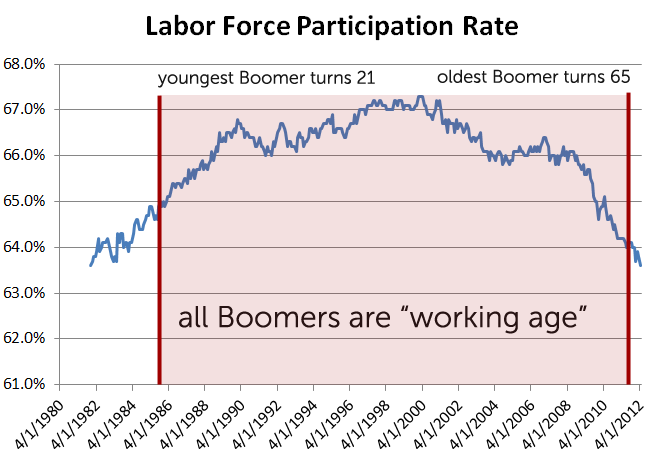 If labor force participation was dropping only due to Baby Boomer retirement, the rate should have dropped from 66.2% in January 2008 to 64.8% today. Instead, it is 63.6%. There is certainly a good deal of room for improvement to get younger people back into the labor force. We shouldn’t simply push the problem off to being Boomer retirement or we risk ignoring a whole generation that is unemployed and flying under the radar. Yesterday I spoke at BlogConCLT on telling stories around data. I wanted to put the slide deck up, so attendees could go back and relive the dream. I have all the text for the presentation in the notes, so if you prefer, you can just imagine your favorite speaking giving this presentation instead of me. I wanted to give an informal critique of this infographic. I honestly believe creating infographics is a form of art and that we need to give deep and careful consideration to all aspects of this art. 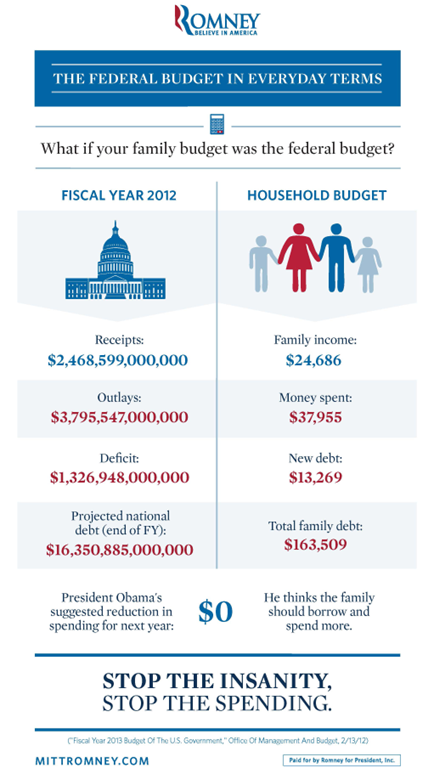 What they should want out of this infographic is to have the viewer see themselves in the family budget. They should be targeting a) people who are independents and b) people who might care about the federal budget. 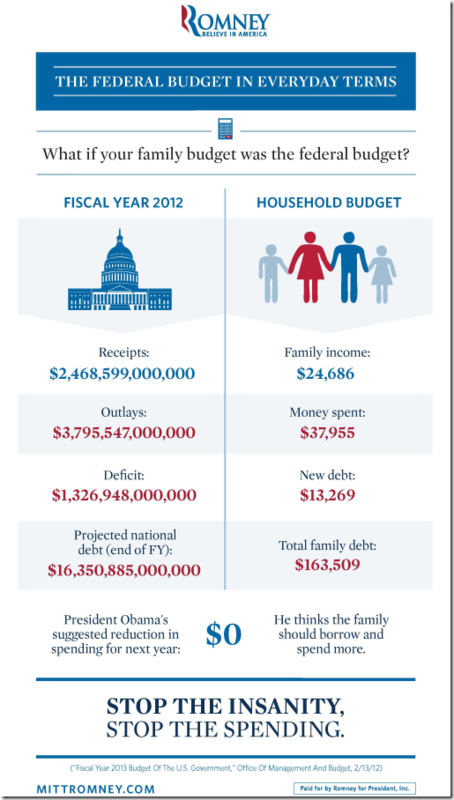 I’m going to go out on a limb and say that the average family of four making under $25K a year doesn’t give a crap about the federal deficit. And complaining about it to them is probably not the best tactic to win their vote. On a quick look, the median income for a family of four in the US is about $67K. This is going to be a number people are a little more familiar with. 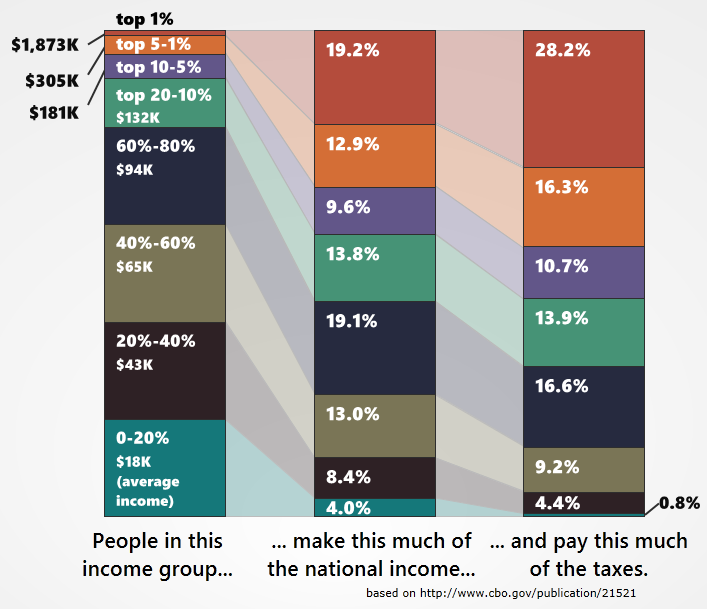 People who do care about the deficit are going to look at the numbers in the infographic and feel a certain disconnect because the income is so far away from what they are familiar with. Can you see what they’re not thinking about? Note: My first calculation was for $65,000, but I saw that this number brought the “spending” number to just to just under $100,000, which is an psychologically important hump. So I bumped the income up another $500 to hit that psychological mark. These kinds of details should be in the mind of every infographic creator. These numbers are going to target an audience that cares about the topic at hand, and ultimately make more of the impact we want. What you see above is only 25% the size of the original. The original version of this thing is a half megabyte and comes in at 2112 x 3731 resolution. Holy cow. 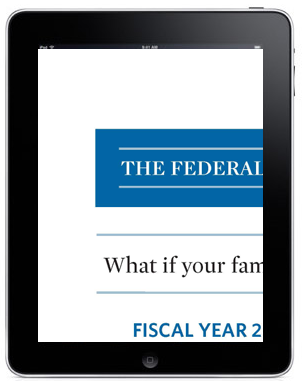 Everyone knows the new iPad has a monster resolution, right? 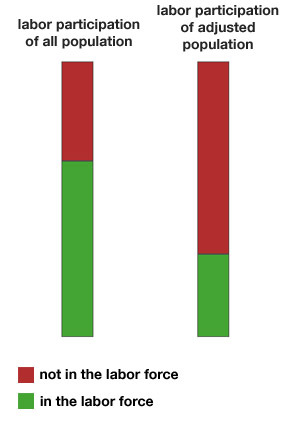 Here’s how this graphic would look at full resolution on a new retina-display iPad. 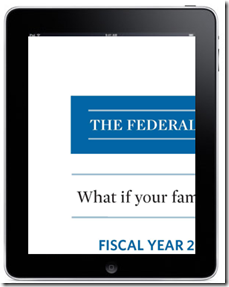 A lot of viewing these days is done on mobile devices with screen sizes much smaller than an iPad 2. By having such a monster infographic, we’ve cut our potential viewing audience way down. And they have no options for sharing it at a smaller size. There is a link to “download and print” it, but who is going to do that? Infographics are seen online. If you’re going to print them, fit them onto an 8 x 11 piece of paper. This infographic does neither. 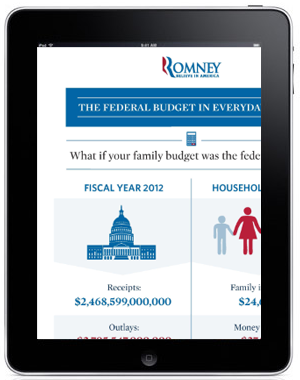 I’m glad the Romney team has made infographics a part of their media platform. 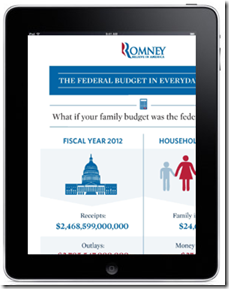 But they have a long way to go to create infographics that make the kind of impact that they potentially can make. A little while back I got sick of parsing through BLS datasets looking for jobs data, so I posted jobs data in handy dandy Excel (CSV) format. I’ve decided to do the same thing with government finance data. This data is actually much easier to find, but getting all the relevent information into the same spreadsheet can be something of a chore. So I’ve went ahead and did it in a “once and for all” sort of way, combining separate data sets into one handy spreadsheet. Before you go ahead and download this, please know that this information ins free because a) it didn’t cost me anything but also b) I think it is important that everyone is able to look through government finance data. That being said, it does take significant time and effort to grab the data, re-format it properly, and combine it in the most useful way. If you’re using this data in any kind of professional capacity or if you appreciate the work it takes to do this, please consider donating to my efforts. If there was no data for a given month, I do not interpolate it. This is exactly what you’ll find if you went to the sources yourself. If you use these spreadsheets for research or visualization, please mention me and link back here. That’s just the polite thing to do. The Excel file has the calculations built in so you can check my work. Again, if you use these spreadsheets for research or visualization, please mention me and link back here. Retire Hatch? No. Hire Dan. Because I live in Utah and because we have a candidate selection coming up and because that selection involves Orrin Hatch, I wanted to say something. First of all, I don’t think Orrin Hatch has been a particularly bad Senator for the state of Utah. He’s been a fairly reliable vote for the right and, from what I hear, he’s a decent sort of guy. I have a “thing” against career politicians and, at 36 years, I think Senator Hatch meets that definition, but I’m not on a mission to take the guy down. For me, the “Hatch election” has nothing to do with Orrin Hatch. It has everything to do with Dan Liljenquist. I met Dan back in 2010, long before he decided to run for Senate. Holly Richardson, a Twitter friend, introduced us with a view toward taking some of Dan’s work and turning into visuals or videos that he could use for presentations. It was then that I learned about Dan’s incredible political career which, at that time, was hardly even 2 years long. Dan was elected in 2008 and asked to be placed “where the money is”, so he got dumped into the “Retirement and Independent Entities Appropriations” committee, which was about as boring a place as possible. Except that “retirement” meant pensions and the Utah pension fund was (like nearly all pension funds) a heavily invested fund. Which means when the stock market collapsed in 2008-2009, so did our pension fund. This wasn’t just “a problem”. This was a life changing, program ending, budget apocalypse type of problem. And Dan got to deal with it. Whee. But what happened next was remarkable. Dan started with the concept “We will keep the promises we’ve already made to our retirees”. This is important to me because, although it seems like a lot of conservatives are fine with hanging people out to dry, people have lived their lives based on these promises. Maybe some retirees can manage, but for others, their pension is all they have. They’re not about to go start a new career to pick up some extra cash. Dan made it a priority to see that the promises made were kept. Then, he did an exhaustive study of our pension system. He discovered that there were a number of loopholes including “double dipping” (where someone retires early, takes a 6 month break and can then be re-hired, usually at a similar salary) in our pension process and that the defined benefit program was simply unsustainable. His reforms (which were passed with bi-partisan support) saved the Utah state retirement system and most of our budget. This was the work I was going to try to help visualize (before life got in the way, as it does) because the Utah plan had been so successful, Dan was being invited to mentor other states on how to save their pension systems. It is this kind of fiscal reform that Dan is passionate about. When we spoke, it was like talking to my wonkiest friends about where the “real” problems are in federal finance, what kinds of reforms can actually be made and take hold without hanging those who genuinely need the program out to dry. Dan has a passion for fiscal reform and sustainability. In that way, I believe Dan Liljenquist could be a Paul Ryan for the US Senate. This is why I support Dan Liljenquist over Orrin Hatch. I hate that politics makes us bash one to elect the other (and I haven’t been very happy with the Hatch campaign’s attacks on Dan), but there it is. The easiest way to elect Dan Liljenquist is through the delegate selection process. Utah has neighborhood caucuses on Thursday, March 15th (you can find where yours will be held here). There, caucus attendees will select delegates for the state convention. At the convention, these delegates will vote to select primary nominees. Dan needs delegates to vote for him in order to run for Senate. If you live in Utah, please attend the caucus to vote for (or be) a Dan Liljenquist delegate. UPDATE: Nate Silver pointed me to the BLS extrapolation of their population adjustment data (Table C at the bottom of this release). Long story short: the 1.2 million change in “Not in the Labor Force” is due entirely to the population adjustment and is not (as I assumed when writing this post) a straight across-the-board proportional increase. From December-January, we actually saw a “Not in the Labor Force” decrease which would mean people returning to the workforce. This is awesome. I’ll leave this post here as a testament to my own ignorance. BLS data came out today and, if you follow me on Twitter, you’ll know that’s kind of “my thing”. I tried to explain this in tweet form, but it requires a bigger canvas. There was some noise made today that we say “1.2 million people drop out of the workforce”. Zero Hedge and Iowahawk, both of whom are usually really good with numbers, made this claim. And I want to explain why that isn’t so. First, let’s look at where that number comes from. In the BLS Employment tables, there is a stat called “Not In The Work Force”. That number rose from 86.7 million in December 2011 to 87.9 million in January 2012, a rise of 1.2 million in one month. Usually, when I talk about “people dropping out of the labor force”, I’m talking about the actual stat “Civilian Labor Force Level” decreasing as a raw number. This isn’t what happened. In fact, the Labor Force jumped half a million between December and January (the third biggest jump since the recession began). So… the labor force rose dramatically, but “not in the labor force” also rose dramatically. Why is that? The answer lies in the population. Normally population increases are a super-boring statistic in the job report. They always go up about the same amount, 150K-200K per month. However, the BLS does an annual adjustment every January. 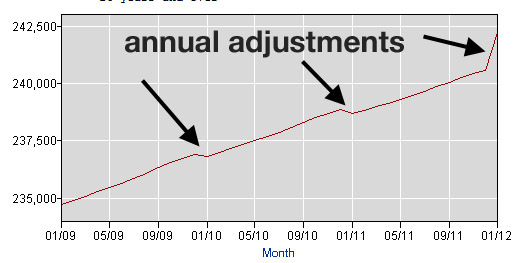 The last two adjustments have been downward, but this January, the adjustment was a huge upward one. That’s a population adjustment of 1.7 million people. That’s big. In fact, that’s second biggest population adjustment in BLS data ever. So when the population is adjusted, everything else in the data set gets adjusted too. The Labor Force goes up, Employment goes up, and the Not in the Labor Force goes up. Now, the concerning thing about this adjustment, and the only mote in an otherwise spotless jobs report, is the distribution of this adjustment. 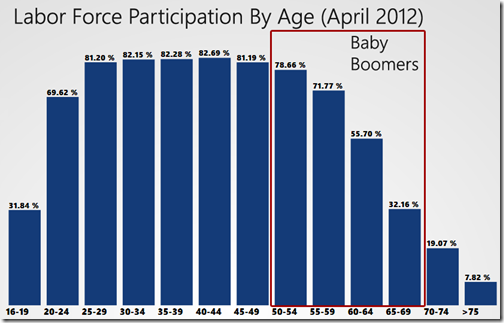 We have a labor force participation rate of 63.7% (which is very, very low). If we add a hundred people, ideally we’d like to see at least 64 of them added join the workforce (to keep that participation rate up). We want to see the labor force grow at least on the level of the population. The BLS added 1.6 million people to the population number but only 30% of those were added to the Labor Force. That’s upside down from what we should expect in a normal adjustment. Now… what does this mean? Here is my theory based on how I understand the stats work. At the end of 2011, the BLS re-calculates their population numbers and says “Whoa… we’ve way undercounted the population, so let’s adjust that number.” They adjust that number up and all the other numbers with it go up too. So what happened was that the “Not in the labor force” count did go up, but the population adjustment amplified the increase. And the Labor Force probably went down, but the population adjustment made it look like it’s going up. I did some rough calculations (adjusting the December population upwards so that it more closely matches the January population) and, if we smooth the population adjustment, the jobs report looks less rosy. It looks like we lost another 450K from the labor force, which accounts for nearly all of the drop in unemployment. The complicated nature of these numbers means that this observation won’t get very much traction (and, honestly, I’m not 100% convinced I’ve accounted for everything so maybe it shouldn’t) but it fits into the overall observation that employment increases are just not keeping up with population increases. I wouldn’t say this is alarming, but it is concerning.